Water is something we don't quite appreciate in Singapore and probably in developed countries all over the world. 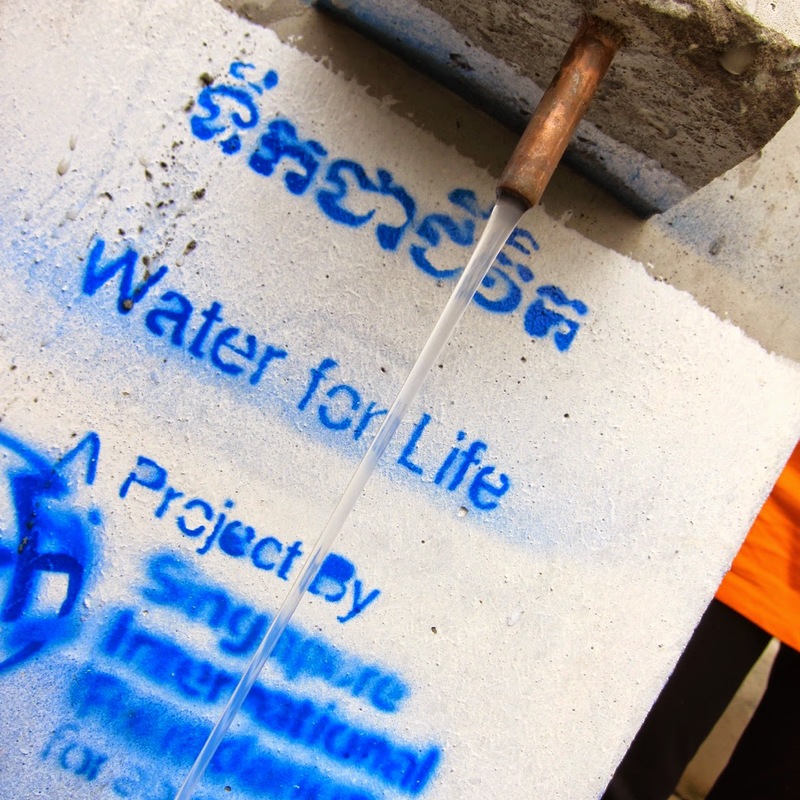 Clean drinking water is easily accessible at the turn of a tap, and cheap too. In the villages we went to, access to water is not a problem. Water can be found in many places, via rainwater collection, surface wells, drilled wells, ponds, streams, etc. However, it's the lack of access to clean water that is causing all kinds of health reasons. Water sources in the open are shared by humans and animals alike, with instances of frogs living in water tanks. Well water is prone to contamination while the ground water which comes from metres below the ground is often red in colour from residual iron ore.
From what our facilitator shares with us, the mortality rate for children in Cambodia is about 20% and one cause is water-borne diseases such as diarrhea. One cheap way in which clean water is provided is through biosand filters, which costs about USD65 and is provided to the villages at a highly subsidised rate of USD7. Why is it not free then? That's cos free things are often not appreciated, and its to inculcate a sense of ownership. 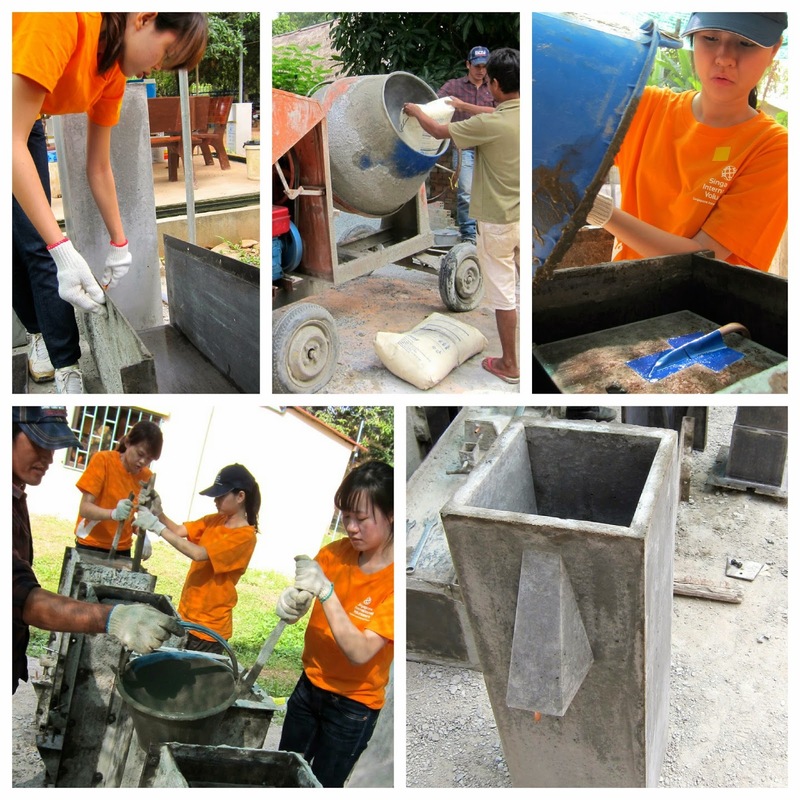 In preparation for the installation of the bio-sand filters, we first built the concrete tank by assembling the mold. Oil is applied to ensure that the concrete don't stick to the mold and a copper pipe is put in place using duct tape. This copper pipe is where the filtered water will eventually flow through. Next, concrete is prepared and poured into the molds. 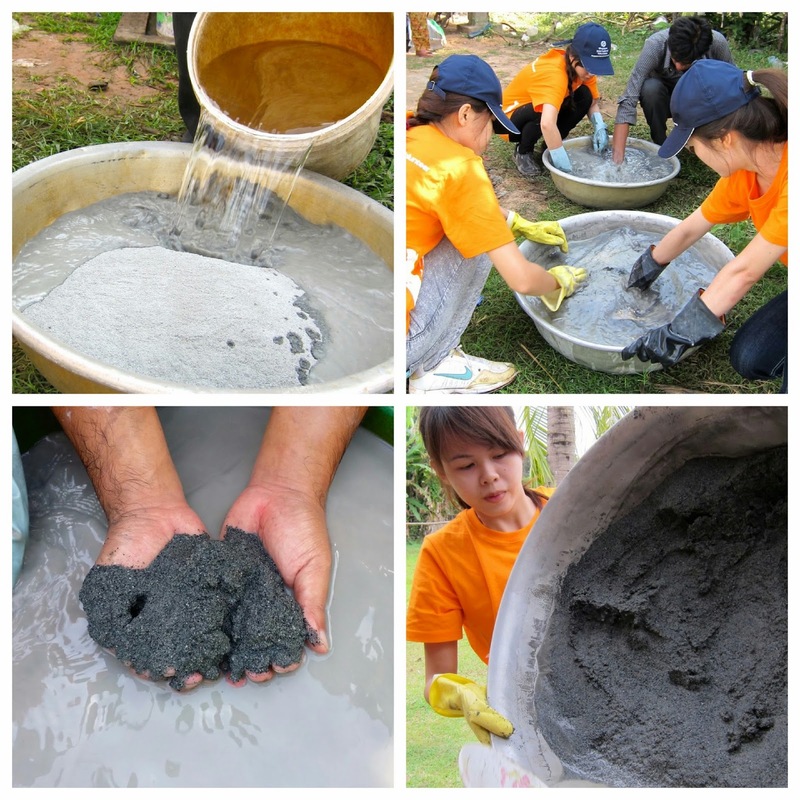 Sticks are used to stir the concrete to ensure that there are no air bubbles. It is then left to cure, for the next volunteer group to use. 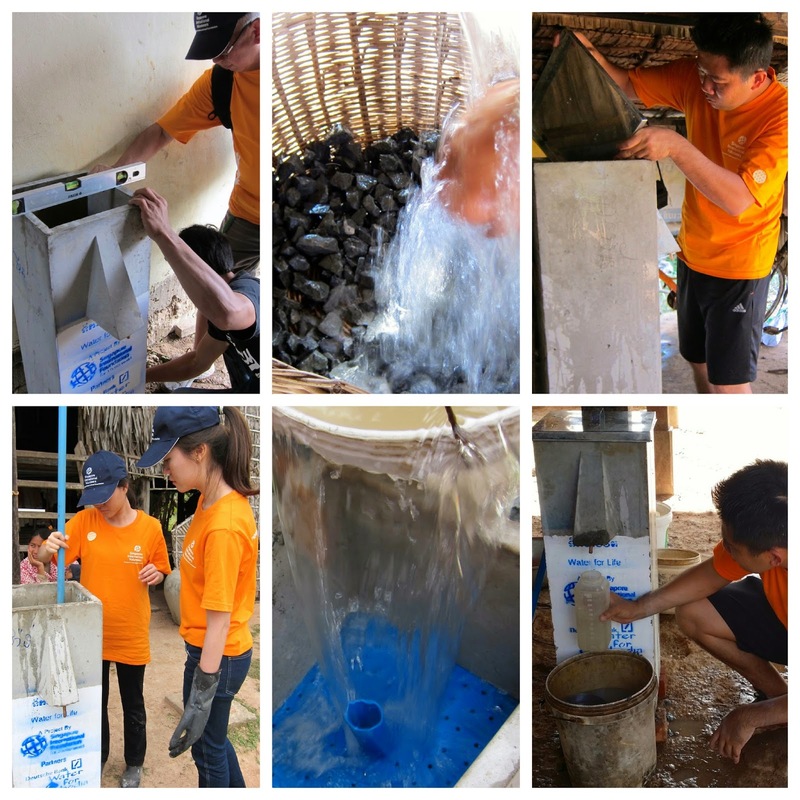 In our case, we opened up the molds that were done by the previous group, while the filters that we were going to install in the villages have already been put in place by a team of local installers. For the next two days, we went around the villages to install the water filters. Each team had three to four volunteers, along with one or two local installers who also helped us translate between English and Khmer. One of the more tedious tasks involve the washing of the biosand to get rid of mud and other impurities. It has to be washed three times, and its probably the more physically taxing part. Lots of strength are needed to swirl the heavy and compact biosand, plus we had to squat most of the time. We really wished we brought a folding stool along. While the biosand is being washed, the concrete tank is simultaneously prepared for installation. A suitable location has to be found, preferably under shade and near to the home occupants. After making sure it is level to ensure proper water flow, large gravel is washed and poured into the tank. This is the bottom layer which helps prevents the smaller gravel from going into the copper pipe and damaging it. Next, smaller gravel is washed and poured into the tank, before the clean biosand is poured on top. Careful measurements have to be taken to ensure that the various materials are in the correct quantities and for the filter to work properly. A diffuser (the blue plate with small holes) is then placed on top to protect the biosand and to prevent it from being damaged when water is poured into the filter. Lastly, the flow of water has to be measured to be between 600ml to 900ml per minute. Together, the various layers are able to remove pathogens and suspended solids through biological and physical processes, and helping the family lead a healthier life. The benefits go further than just clean water though, when you consider that that the families will be less prone to water-borne diseases, which means less medical bills and more time being devoted to farming and taking care of the family. Besides the volunteering part, the peaceful and tranquil nature of the villages also left a lasting impression. 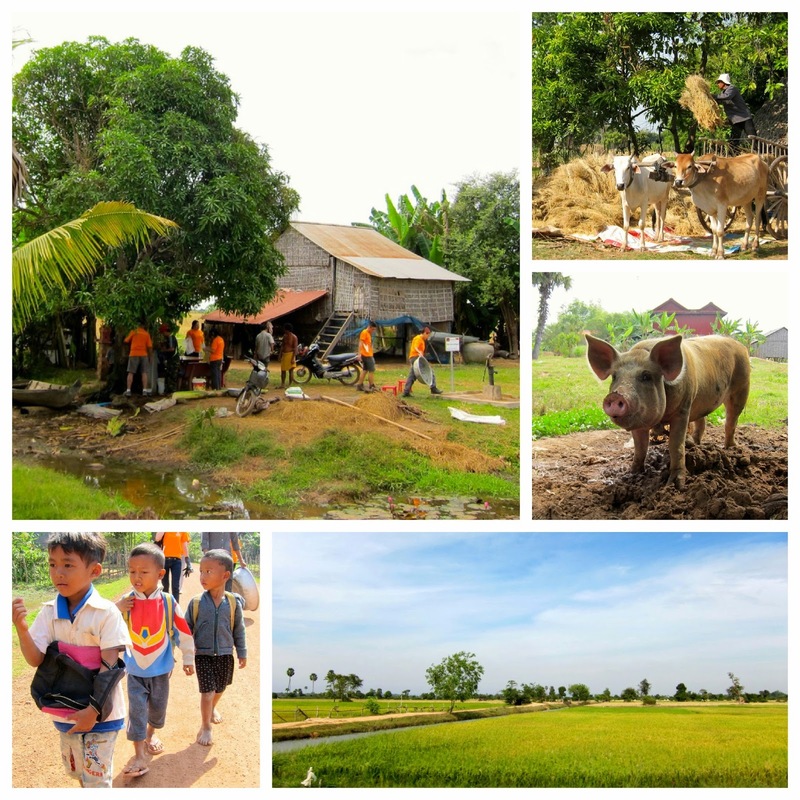 Carefree kids playing barefoot on the sandy roads; pigs and chickens living in co-existence with humans, often within the same compound; and rice-farming and the beautiful rice fields. It's another part of life that is a world away from the fast-paced urban city life. It's a reminder to myself, to sometimes slow down, breathe and appreciate the moment. Fifteen of us like-minded individuals went, each with a common cause to give something back to society. Am also blessed to have met two complete strangers, who along with a colleague, became good friends and traveling companions at the end of our Siem Reap adventure. Also had the chance to mingle and interact with the villagers, though a bit limited due to the different languages and also cos our group is quite introverted (lol). I'm sure we could have contributed more, and we want to, but for now, the memories of squatting down and washing sand; walking along the village roads and seeing the smiles of villagers; shall remain as we go back to our day jobs. Till the next volunteering trip!